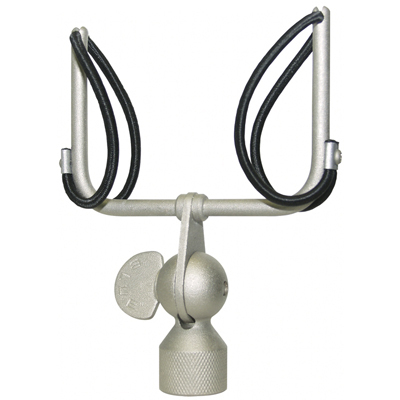 The Cactus is a multipattern, large-diaphragm tube microphone. A switch on the power supply provides nine selectable pickup patterns, from omni to figure-of-8. The mic’s capsule is Blue’s B7 design (available separately in a lollipop-style head for Blue’s various Bottle mics). The B7 was voiced to mimic Neumann’s K47 capsule, and like the K47 is a dual-diaphragm, single-backplate, center-terminated design. The 24mm diaphragm is made of 6-micron Mylar. 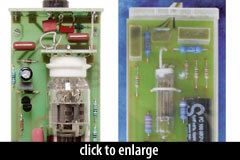 The amplifier design is a transformer-balanced single vacuum tube design. Although previously reported here to use a subminiature tube, that turns out to be true only of the very first production runs of the microphone. The very first Cactus microphones used the same Russian tube as the famous LOMO 19A-19, and a Jensen transformer. 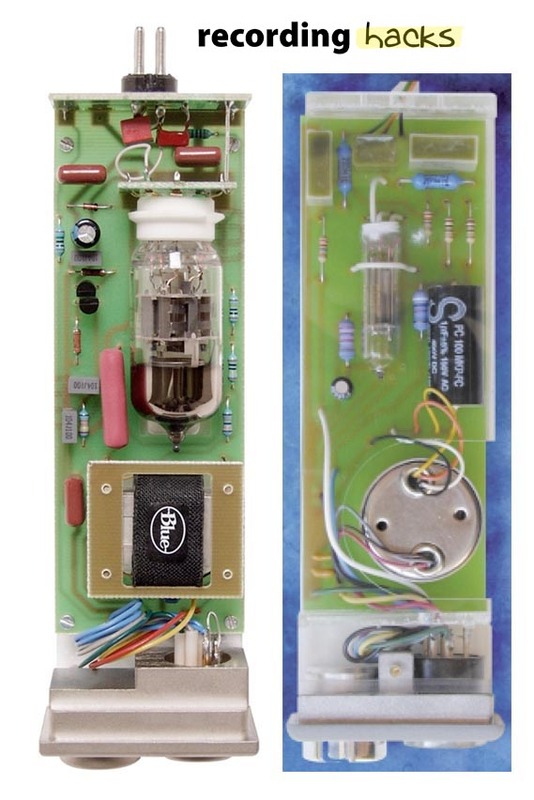 As demand for the mic increased, the circuit, tube, and transformer changed; the tube is now an ECC88/6DJ8 twin triode, and the transformer is made in-house at BLUE. The Cactus, like several of Blue’s early products, was the subject of an intellectual property dispute in 2006, when the original manufacturer, SIA Scruples/Violet Design, attempted to register a lookalike microphone with the EU’s “Office for the Harmonization of the Internal Markets” — essentially the EU’s trademark office. The OHIM called Scruples’ registration invalid, awarding the IP rights to Martin Saulespurens of BLUE. For a time, this mic was known as the Violet JZ-5 or JZ5. BLUE has the philosophy of having each of their mics have a really colored sound. Well, this one is colored really dark. I mean, woolly, even. It had a really fantastic low-end response, but this is not a mic to use if you want presence. With a peak at around 5kHz and a steady rolloff from there, this would be a great mic for horns or any application you might prefer a ribbon mic on. It worked OK on the male vocalist, but was not happening on the female. It was way too dark for my taste on acoustic… Forget about the piano… It also uses the lollipop system, so you could try other capsules on it. after spending the past two months using it to record virtually every sound source imaginable, I have come to the conclusion that it’s a microphone that will be hard to live without. The Cactus initially included Blue’s Series 1 shockmount/popfilter; more recently, the S1 was swapped for the less-expensive “Series 2,” aka S2 elastic shockmount (which is compatible with the Blueberry and Dragonfly microphones too). The S2 requires that the Cactus body have two knobs protruding from each side, which presumably recent shipping models do have. 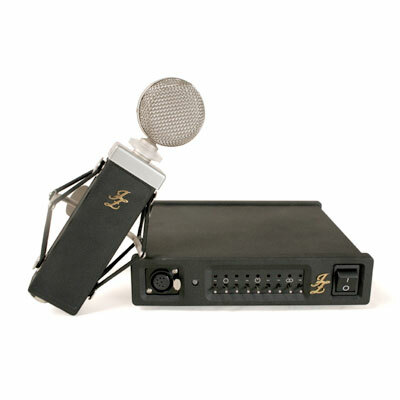 The mic also includes the PowerStream power supply, formerly known as the 9610, which has a pattern-control switch for adjusting the mic’s directionality. A high-grade mic cable and ATA Flight Case are included. The Blue Microphones Cactus is also known as: JZ5, JZ-5.